fillets close to each other and to hold the marinating juices. Place the foil container on a baking sheet and set aside. Combine the light brown sugar, olive oil, soy sauce, lemon juice and water in a shallow bowl. 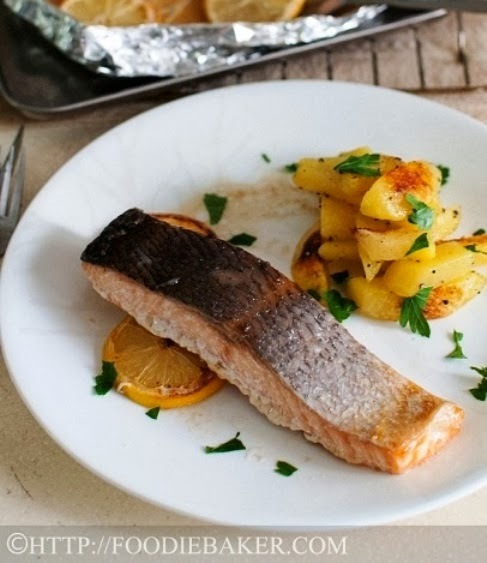 Coat the salmon fillets both side with the sauce and place it in the foil container, skin-side up. Pour in the sauce and place the lemon slices on top of the salmon fillets if using. Bake for 15 to 20 minutes in the middle rack until the salmon is cooked through. Transfer the salmon onto a serving plate and drizzle the sauce all over. Serve with baked fries (recipe follows). Place the sliced potatoes in a small pot. Cover with water and add in 1 tablespoon table salt. Lower it to a simmer and cook until the potatoes are forked tender. Drain and return the potatoes to the pot. Place the pot of potatoes over low heat and toss until all excess water has evaporated. Drizzle in enough olive oil to coat the potatoes lightly and season with salt and pepper. Add in any herbs if using. While the potatoes are still hot, transfer them to the lined baking sheet in a single layer. golden brown on all sides.